Alex today...not taken with my new camera...see the vast differences??? I do! Matt took this in the rain when we picked up Alex from class and were headed downtown Indy to the Nat for Matt's Guerin swim team practice...i.e. Matt, and Roch, his coach, more on that another time. The time has finally arrived. 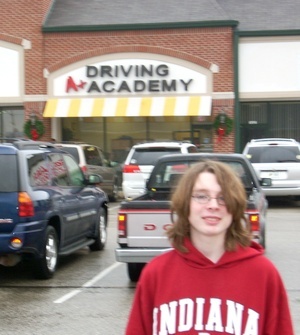 The ALL-IMPORTANT driver's permit and Driver's Ed class for Alexander! Can life get any more exciting for a 15 year old boy? Not much, I am thinking, at least for this boy, who has been waiting FOREVER to be able to drive a car. We have never known anyone to like cars as much as Alex likes cars. When he was little he would carry two hot wheels cars with him, one constantly clutched in each hand, playing with them all the time. He never wanted any other toys...every dollar he was ever given was spent on little Hot Wheels and Matchbox cars (2 for a buck, what a deal). Every surface of our home was used for one purpose: ROADS...roads on the back of couches, floors, chairs, tables, counters, you name it...it's only purpose was for creating a roadway. Every cabinet I would open, every drawer, every shelf was used for parking the little cars. They were everywhere. Every. Where. All. The. Time. He still has them...hundreds of them...all stashed in his room and/or the attic. He learned to count with the cars. Learned colors with the cars. Learned multiplication/sets/division, etc. with the cars. You get my drift. The cars were his entire life. He still buys them occasionally. So, the day has arrived and at the end of the three week course, he will be able to get behind the wheel and drive, drive, drive. With Mark.